Cursach J., Rita, J., 2012. 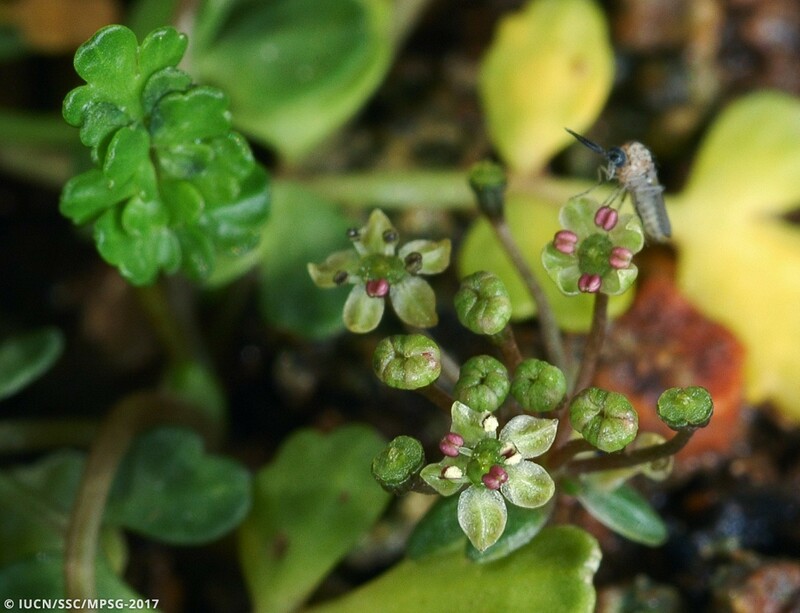 Reproductive biology and reproductive output assessment in natural and introduced subpopulations of Apium bermejoi, a critically endangered endemic plant from Menorca (western Mediterranean). Nordic Journal of Botany, 30: 754-768. Rita J., Cursach J., 2013. 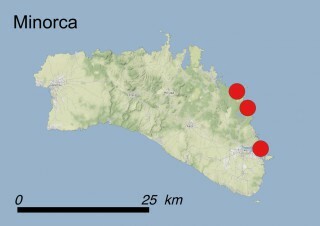 Creating new populations of Apium bernejoi (Apiaceae), a critically endangered endemic plant on Menorca (Balearic Islands). Anales del Jardín Botánico de Madrid, 70(1): 27-38. Rita J., Capó M., Cursach, J., 2016. Helosciadium x clandestinum un nuevo híbrido aparecido en Menorca (Islas Baleares). 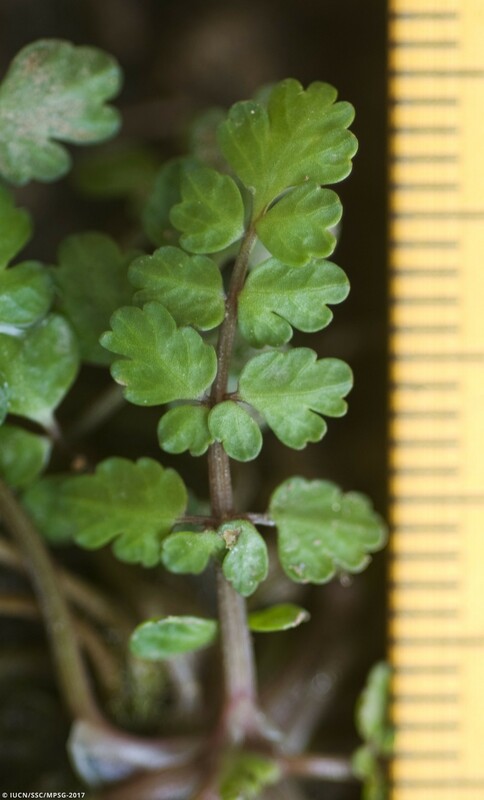 Flora Montiberica, 63: 130-136. Where it is found ? 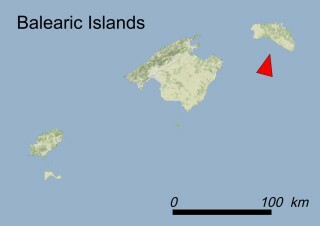 Apium bermejoi is endemic to the Balearic Islands, and occurs in the eastern part of the island of Minorca. 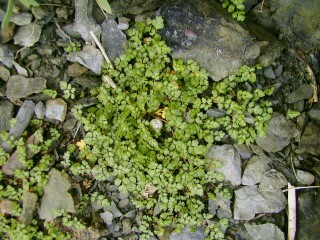 There it is only found in two small areas separated by a rocky zone about 200 m wide. The total population numbers less than 100 individuals with strong yearly fluctuations and covers an area of just a few dozen square meters. 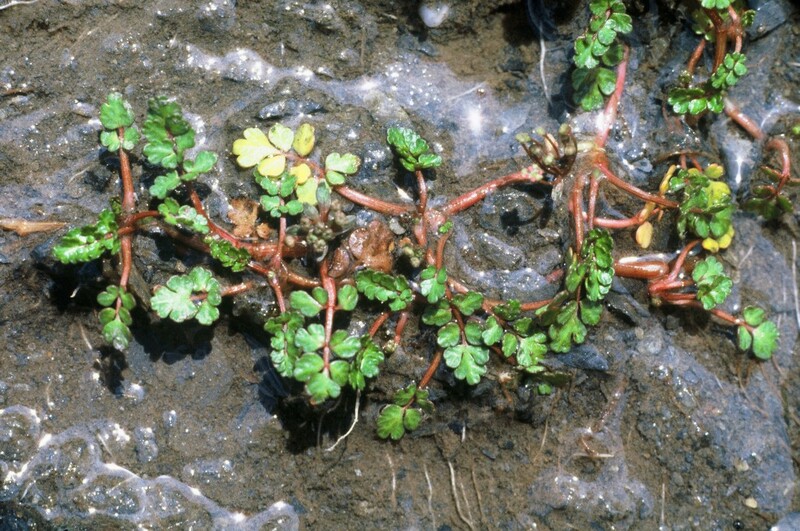 This species grows in stream beds (Habitat 5.2: Seasonal-Intermittent-Irregular Rivers, Streams, Creeks) which are dry during summer and even during dry winters. 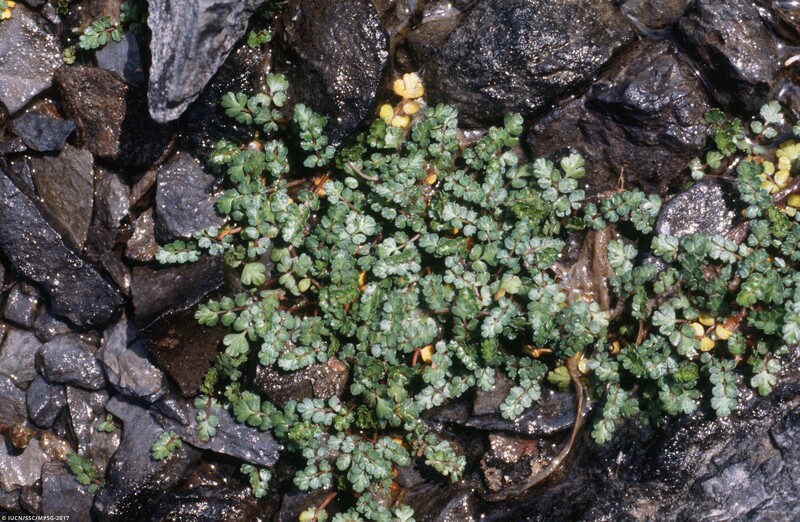 In the wild it prefers thin acidic soils within small rock depressions, but under cultivation it is indifferent to the type of substrate, requiring only moderate sun exposure. 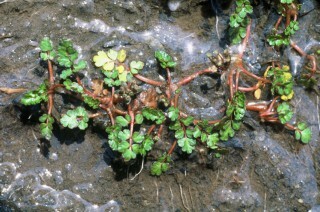 This perennial herbaceous plant creeps over the ground. Its hollow stem is equipped with narrow grooves that secrete aromatic oils, giving to the whole plant a celery smell. Its leaves are compound, with about 5-7 deep lobed leaflets. The flowers are greenish white and arranged in simple umbrella-shaped inflorescences. 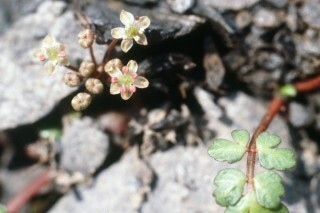 A. bermejoi usually flowers between April and May, and fructification occurs in June. 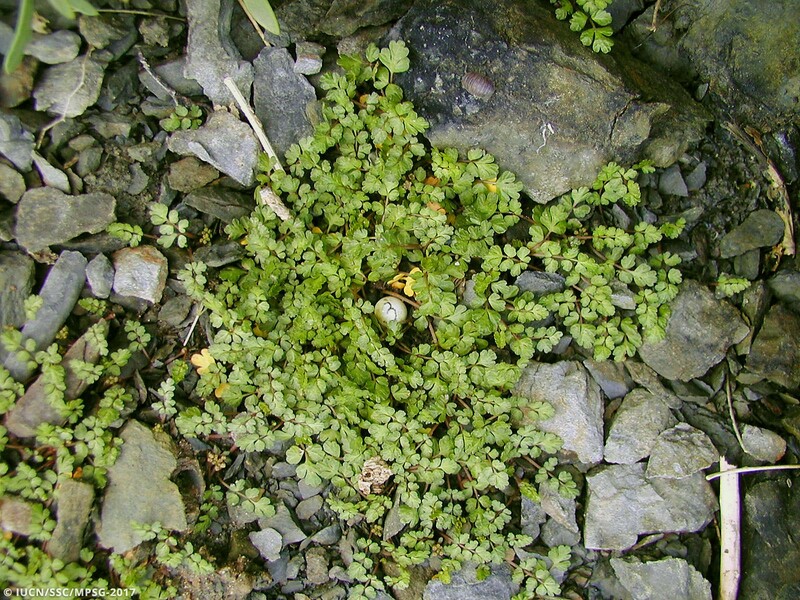 A. bermejoi reproduces from seeds but can also reproduce vegetatively through stolons. Pollination occurs through facultative xenogamy, where ants are the main pollinator agents, but flies may also be efficient agents. This species disperses via geoautochory. The role of the granivourous ants as fruit dispersers is still unclear, but it has been proved that ants look for fruits and carry them to anthills. Seeds germinate easily within a few weeks if the conditions are appropriate. This species has been categorized CR (Critically Endangered) according to B1ac(iv)+2ac(iv), C2b criteria; the original population occurs in a single site and the total number of individuals is very low (about 80 clumps in 2015) with strong yearly fluctuations (some years the population was reduced to less than 20 patches). Nevertheless, nowadays the total population, including a subpopulation cultivated ex situ, is about 250 patches. The species is threatened both directly and indirectly. Its habitat is extremely unstable with available water and nutrients varying greatly from year to year. 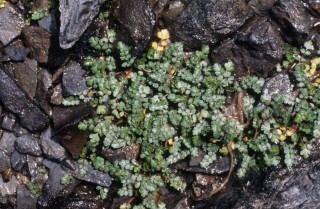 A. bermejoi does not support very well competition from other species. It is directly threatened by motorbike trampling (threat 6.1: Recreational activities). Ants are fruit predators, but it is possible that they also could facilitate fruit dispersal. The larvae of the moth Orthonama obstipata Fabricius (fam. Geometridae) can severely prey leaves and even kill plants (threat 8.2.1: Problematic native species/diseases – Unspecified species). Climate change may cause changes in its habitat, mainly with a reduction of spring rainfall and an increase of heat weaves during the reproductive stage (threats 11.2: Droughts and 11.3: Extreme temperatures). The hybridization with Apium nodiflorum could be a threat both in the wild and in Botanical Gardens (threat 8.2.2: Problematic native species/diseases - Named species). Legally : A. bermejoi is included in the Annex of the Spanish Royal Decree 139/2011 with the category of “in danger of extinction”; this grants its protection in its natural site. Moreover, the species is included in the Appendix I of the Bern Convention and Annexes II and IV of the 92/43 EC ‘Habitats’ Directive, where it is listed as a priority species. In 2008 a Recovery Plan was approved by the Government of the Balearic Islands. The population of A. bermejoi falls within the Natura 2000 site ES0000235 ‘De s’Albufera de la Mola’. In situ: From 2003 to 2006, the University of the Balearic Islands (UIB) started a rehabilitation programme for A. bermejoi in its natural habitat with financial support from the MAVA Foundation, Consell Insular de Menorca and Govern Balear. In this framework, a new population was created in a new locality. 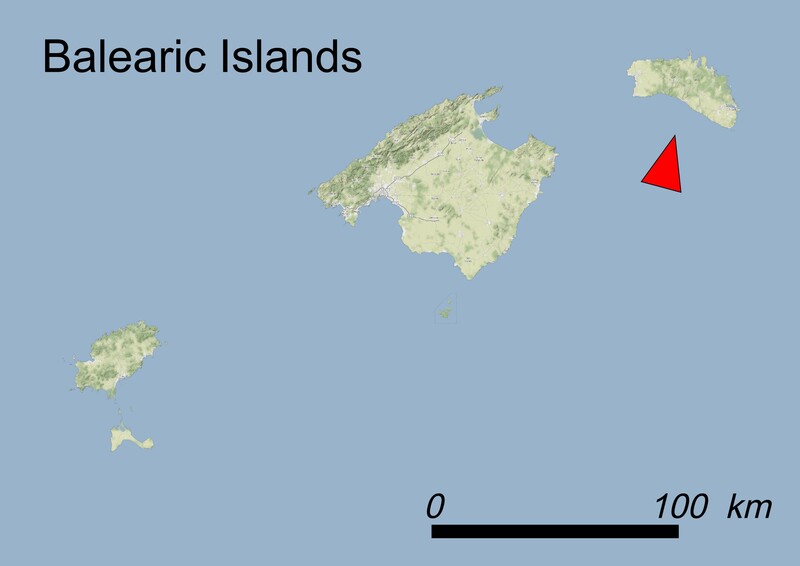 In 2008 two new populations were established in the wild by UIB in collaboration with Govern Balear. All of these introductions were done with plants generated from seeds of the original population. Unfortunately in 2015 a hybrid with Apium nodiflorum was detected in one of these new localities and it was destroyed to eliminate any further hybridization risk. Nevertheless, nowadays the species is established in two new localities, in one of them the number of individuals is similar or higher to the original population. Other further introductions done by the Govern Balear after 2008 were unsuccessful. An annual monitoring programme of all subpopulations is being performed. Ex situ: Seeds of this species are stored in the Botanical Garden of Barcelona, in the seed bank of the Universidad Politécnica of Madrid (BGUPM) and in the seed bank of the Sóller Botanical Garden of Majorca, where the plant is also under cultivation. It is important to know if the genetic diversity of the natural population is replicated in the new subpopulations created both in the wild and in botanical gardens. It is necessary to control the appearance of hybrids in any of the subpopulations, including the ones cultivated in botanical gardens. Dr. Juan Rita, University of the Balearic Islands. Dra. Joana Cursach, University of the Balearic Islands. Sr. Pere Fraga i Arguimbau, Institut Menorquí d’Estudis. Sr. Gabriel Bibiloni, University of the Balearic Islands. Dr. Eva Morgues, Government of the Balearic Islands. Dr. Mauricio Mus, University of the Balearic Islands. Dr. Llorenç Suez, Autonomous University of Barcelona. Josep Lluis Gradaille, Jardí Botànic de Sóller.